The Philippine government has already declared a state of national calamity in the wake of the devastation caused by super typhoon Haiyan (Yolanda) on several Visayas islands. More than 10,000 are feared dead after Haiyan, the strongest storm in the world this year, ravaged entire communities – especially the costal barangays (villages) facing the Pacific. Visayas comprises several islands located in the central Philippines. Haiyan left a trail of destruction across the Visayas islands of Samar, Leyte, north Cebu, Negros and Panay. It also affected some parts of Romblon, Mindoro and Palawan. But it was the east Visayas provinces of Samar and Leyte, which are closest to the Pacific, that bore the brunt of Haiyan’s fury. The Philippines is situated in the typhoon belt of the Asia-Pacific region, which means it gets battered by more than a dozen storms every year. 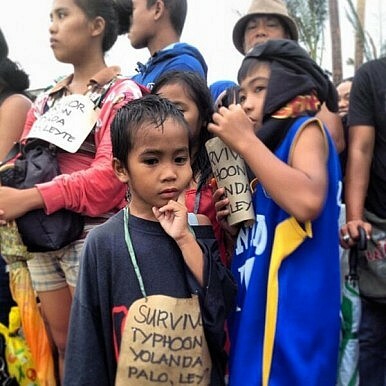 Storms usually trigger floods, landslides and strong winds on the islands and many Filipinos prepared for these extreme elements when Haiyan was first reported by the weather bureau. But Haiyan was different. It proved to be a real super typhoon when it caused a tsunami-like storm surge that instantly killed thousands. The storm surge is responsible for the massive destruction in Tacloban City, the capital of Leyte (and also the hometown of Rep. Imelda Marcos, wife of the late dictator Ferdinand Marcos). When Haiyan was about to make landfall, many sought refuge in sturdy facilities like the airport and gymnasium – but these were also laid to waste by the storm surge. A local official said that had they were advised to prepare for a tsunami, they could have chosen an evacuation center situated on higher ground. Visayas power and communication lines were destroyed when Haiyan hit the region last Friday. It took almost a day for the rest of the Philippines, including capital Manila, to be informed about the huge damage left by Haiyan. After the partial restoration of communications in Tacloban, the country and the world were shocked by the images of devastation and misery in the city. Initial reports indicated that 90 percent of the province took a severe beating from the storm. The situation is said to be worse in other remote islands. As of this writing, there are still many towns which couldn’t be reached because of ruined roads and absence of communication signals. But aerial surveillance by the military has confirmed fears that many villages were reduced to wasteland by the storm. Worse, medical services and relief goods could not be immediately provided to hungry and weary survivors. The areas hit by Haiyan are among the poorest provinces in the Philippines. In fact, Eastern Visayas is the third poorest region in the country. Now it is a poor region rendered poorer by a typhoon; and the impoverished will likely become more impoverished than ever. Rebuilding Tacloban and the rest of Visayas will prove to be a daunting task. Haiyan wreaked havoc at a time when the country is still recovering from a deadly earthquake which shook the island of Bohol (also in Visayas) just a few weeks ago. This is turning out to be a calamitous year for the Philippines despite the stellar growth of its economy. The priority at the moment is to rescue more survivors and provide relief to disaster refugees. Thankfully, aid is pouring in from all over the world. Many Filipinos are also showing their solidarity by volunteering in the rehabilitation efforts. But this is not enough. It’s not sustainable to focus resources on post-disaster relief operations. There should be a comprehensive plan on how to prevent massive casualties every time a disaster strikes the islands. Haiyan proved once more that the Philippines are extremely vulnerable to the harsh impact of climate change. But it also exposed the sorry state of the country’s infrastructure, chaotic land zoning system, pre-modern weather facilities, unreliable communication facilities, and inadequate disaster preparedness programs. The reported breakdown of law and order in Tacloban is more or less due to the failure of the government to extend urgent aid to survivors. Apparently, there was no system or functioning mechanism on how to quickly respond to emergency situations. Haiyan also highlighted the alarming deterioration of the country’s environment. For example, large-scale logging operations have depleted the watersheds which often cause massive flooding in the lowlands. Because of environment pollution, super storms like Haiyan can evolve into man-made disasters. As for the Southeast Asian region, Haiyan should remind regional leaders to collectively address the impact of climate change. At a minimum, there should be regional coordination during disasters. When Haiyan left the Philippines, it headed straight off in the direction of Vietnam and China.